Benigno”Ninny” Simeon Aquino, Jr was the charismatic, leading opposition politician during the presidency of Ferdinand Marcos in the Philippines. On 8 May 1980 Aquino travelled to America for treatment for his heart ailment. In the spring of 1983 Aquino decided to return home and ask Marcos to step down. Aquino left Logan International Airport, Boston on 13 August 1983, travelling under a false name. When he rang wife Cory, who was still in the United States, he learned that Marcos knew of his plans. Aquino muttered to one of his aides, “They’re going to kill me at the airport and then kill the guy who did it.” Prescient words, as it would turn out. As his plane began its descent into Manila International Airport, Aquino placed a bulletproof vest under his white safari suit. He said to one journalist, “It’s only good for the body, but if they hit me in the head, I’m a goner anyway.” Awaiting Aquino were around 20,000 supporters and 2,000 security personnel, ostensibly to secure his safety. At midday on Sunday 21 August 1983, the aeroplane stopped at gate eight. As the “tube” reached the plane, five soldiers walked up to Aquino. They accompanied him along the tube. 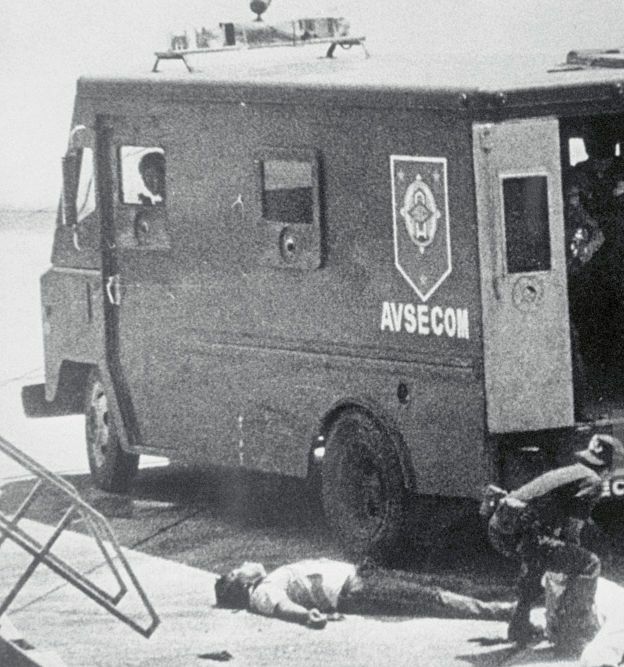 Within seconds of leaving the plane, and despite the apparent heavy security, Aquino was dead, a bullet in his head. A short distance away lay the bloodied corpse of a second man, clad in a white shirt and blue trousers. The government claimed that the dead man was the lone killer. He carried no identification and the only clue was the word “Roily” on the waistband of his underpants. President Marcos said that the killer had been a professional assassin and had shot one bullet from a .357 Magnum into Aquino’s head from a distance of just 45 cm (18 in). On 30 August 1983, the government announced that the killer was named Rolando Galman. It has never been officially established why, or even if, Galman had done it. In November 1985, to ease public concern with his regime, Marcos called an election, to be held in February 1986. Despite the Commission on Election calling the outcome for Marcos, Cory Aquino and her supporters refused to accept the result. Eventually Marcos and his wife, Imelda, were driven from the Philippines and Cory Aquino became president on 25 February. The Aquino administration was continually plagued by rumours of coup attempts. She retired in 1992.